The American Heritage Center is fortunate to hold the papers and artwork of Jacques Kapralik. Kapralik was a commercial artist and caricaturist whose art was used in the promotion of motion pictures throughout Hollywood’s Golden Era of the 1930s-1950s. Born in Romania in 1906, Kapralik first worked for various European newspapers, drawing cartoons and caricatures of famous Europeans and important events. In 1936, Kapralik immigrated to the United States. He first provided celebrity caricatures for various newspaper columns focusing on Hollywood gossip and events. Jacques Kapralik, undated. Jacques Kapralik papers, #4064, Box 15. University of Wyoming, American Heritage Center. Kapralik was fortunate to work during a time considered the Golden Age of Hollywood and a zenith for celebrity caricatures. Movie studios were putting increased focus and publicity on their stars, attempting to make them household names. 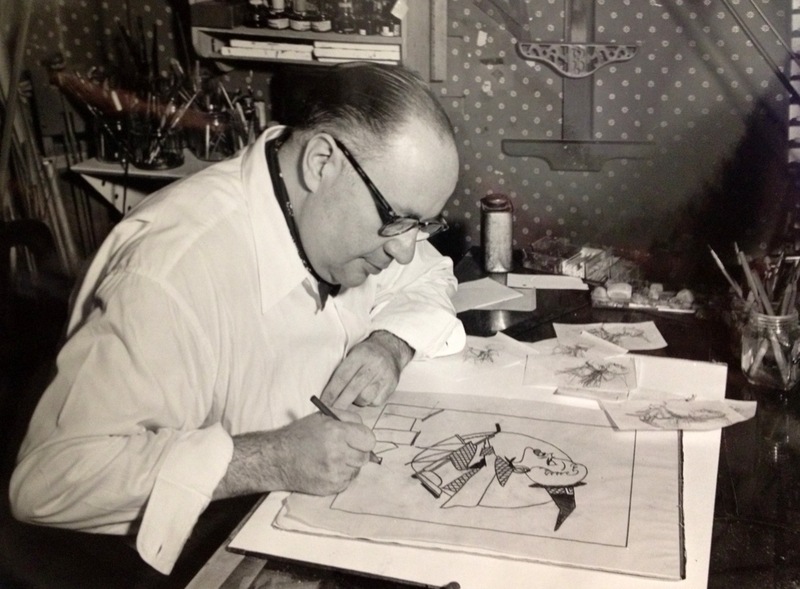 Kapralik’s output of celebrity caricatures increased as he left the newspaper world and began working for movie studios such as RKO, Paramount, 20th Century Fox, Universal, and MGM, creating likenesses of Cary Grant, Greta Garbo, and Lucille Ball, among many others. He developed a distinctive and highly recognizable style for his studio publicity work, much of which was shown primarily in press kits and trade magazines such MGM’s Lion’s Roar Magazine, as well as the weekly Pictorial Review newspaper insert. While heralded as a master of Hollywood caricature by industry insiders of the time, due to the nature of his work, today he remains relatively unknown to the general public. Man of the West with Cary Cooper and Julie London, 1958. Jacques Kapralik papers, #4064, Box 38. University of Wyoming, American Heritage Center. The caricature style Kapralik became most well-known for involved the creation of miniature models from paper and balsa wood. The models were then photographed and used as promotional posters for motion pictures, predominantly MGM films. These 3-D caricature scenes were incredibly elaborate and detailed, taking up to six weeks complete. Notorious with Cary Grant, Ingrid Bergman, and Claude Rains, 1946. Jacques Kapralik papers, #4064, Box 70. University of Wyoming, American Heritage Center. Kapralik also created title sequences for films in the 1930s-1950s, an early innovator at a time when title sequences were just starting to evolve from simple text. His title sequence work included 20th Century Fox’s The Three Musketeers (1939) with the Ritz Brothers and MGM’S Presenting Lily Mars (1943) with Judy Garland. Aside from movie publicity, Kapralik also did advertising work for companies such as Nutrilite, S&W, and Squirt. The Jacques Kapralik collection at the American Heritage Center contains framed originals of Kapralik’s miniature models, original caricature drawings done as publicity for many films, and caricatures used in advertising such products as milk and canned vegetables. The collection also contains many sketches and drafts of his finished works. Numerous copies of the newspaper insert Pictorial Review are also present, the covers of which all feature caricatures drawn by Kapralik. Some of his artwork created prior to moving to the United States is also contained in the collection, mostly featuring famous Germans or other Europeans. Some personal and professional files are also present, including correspondence and newspaper clippings. The collection also contains photographs of Jacques Kapralik, including photographs of him and his wife creating his models. 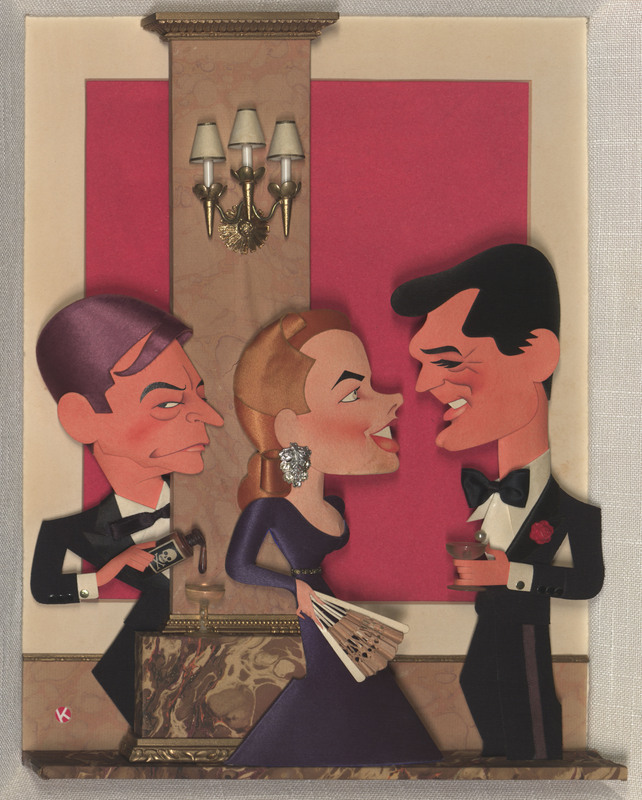 Scanned images of many of Kapralik’s 3D caricature scenes will soon be available on the AHC’s digital collections site. A traveling exhibit is also available from the American Heritage Center. Titled “Cut It Out! : The Hollywood Art of Jacques Kapralik,” the exhibit consists of 23 framed panels of Kapralik’s work, and focuses on how Kapralik’s work coincided with the rise of the Hollywood star system and society’s growing fascination with celebrity culture. 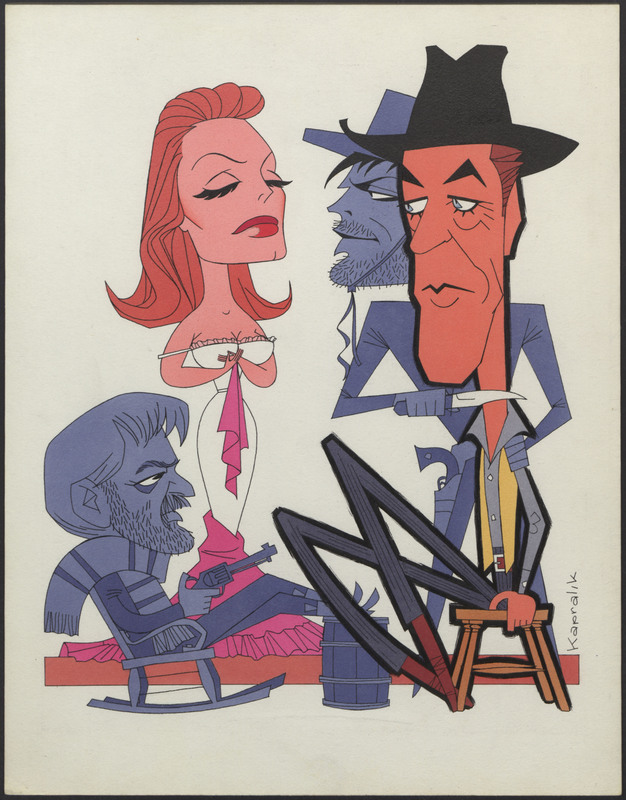 This entry was posted in commercial art, Digital collections, motion picture history, popular culture and tagged commercial art, Jacques Kapralik, motion picture history, popular culture. Bookmark the permalink.